Our stallion roams free with his own herd of broodmares and foals. He is quiet and gentle and managed without the need of whips or chains. He is happy and content and allowed to live his life as nature intended. Click on the picture above to view a short video. The culmination of generations of selective breeding has resulted in the outstanding Hanoverian Stallion Razmataz. Bred by George Walker, Razmataz's pedigree was selected to produce a superb breeding stallion with a strong Dressage influence. Rohdiamant, Weyden, Bolero and Grande are just a few of the exceptional sires found in Raz's pedigree. 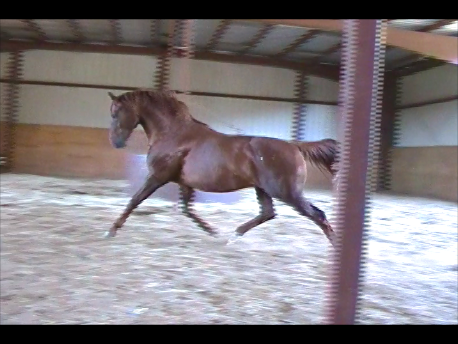 Raz's natural movement is a floating dance across the pasture and the stamp of his grace can be found on each of his foals. As each new crop of foals emerge it becomes quite evident that Razmataz's good character, easy trainability and gorgeous topline are always passed on. Intelligence, and a calm generous nature are the final touches on a truly lovely stallion.